I have a confession to make, this was my first rutabaga. I don’t know what made me do it? I picked it up and put in my shopping cart without the slightest idea of what I might do with it….crazy! Live every day like your last, right? I got home and googled a bit only to learn I had lots of options: roasting, mashing, grating, buttering, spicing, scalloping, and French frying. I had been craving creamy, and happened to have some crème fraiche in the fridge, so creamy it was. After cutting the rutabaga in half I peeled it with a knife, cut it into one inch cubes, and steamed them until they were fork tender. While they were draining, I heated up a bit of butter in a pot and sautéed some chopped garlic and scallions. 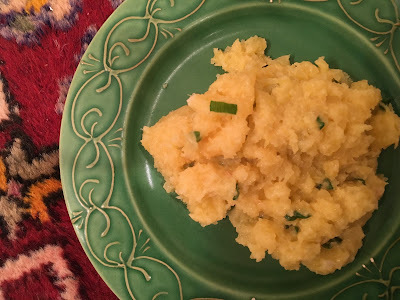 Once the garlic was translucent I added the rutabaga and mashed it all together with a small container of crème fraiche, and salt and pepper to taste. That won’t be my last rutabaga.